Form Description: If you are going to include walking as a regular part of your exercise regimen, you may want to keep track of your progress. After all, if you don�t keep track of what you are doing you won�t be able to see how you do over a period of time. With this Simple Walking Log you can easily keep track of such things as the distance you walked, the amount of time used, as well as the number of steps taken, all of which will be self calculating for you to see what you have done over the time period you are tracking. In addition, you can also keep your thoughts about your walking routine on the log, sort of like an exercise diary. 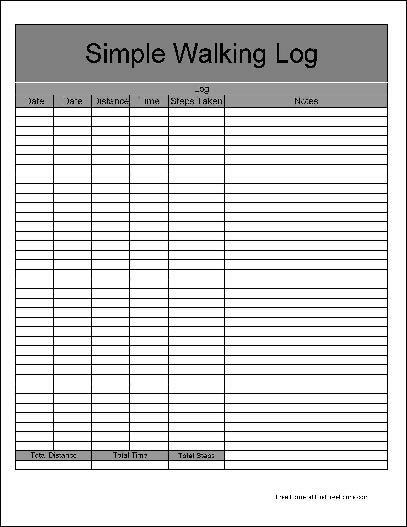 This form ("Basic Simple Walking Log") is associated with the following keywords: Exercise, simple, log, tracking, walking, distance, time, steps, basic.